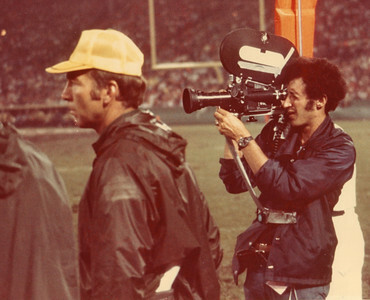 Chuck filming Packers game in Milwaukee for NFL Films in 1974, alongside The Great Bart Starr, Packers Head Coach. This was the first season Chuck worked for FILMS. The camera is his Arriflex M with an Angeniuex 12-120mm lens, shooting 48-96fps. 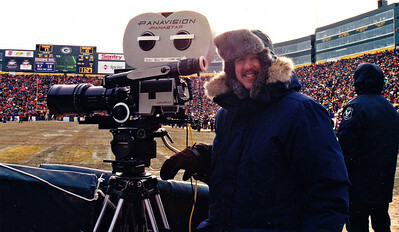 Chuck Cohen at the 1996 (played in Jan '97) NFC Championship Game in Lambeau Field, end zone/on the field camera position, for NFL Films. The temperture on the field was -23 degrees below zero! He's shooting with the Panavision Panastar high speed camera and Panavision Primo 135-425mm lens with 2X extender. 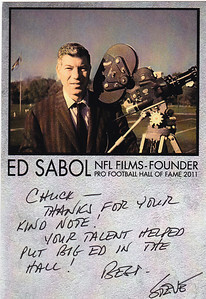 A note to me from NFL FILMS President Steve Sabol, in regards to his dad and the founder of NFL FILMS, Ed Sabol, being inducted into the NFL HALL OF FAME in 2011, and thanking me for my 17 years of filming games for them. He will be missed. 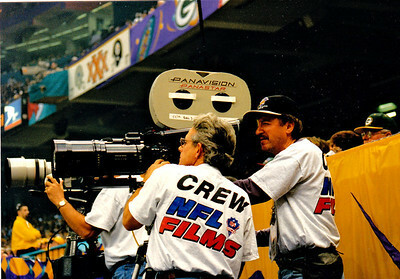 Chuck Cohen films Super Bowl XXXI in New Orleans for NFL Films, as his camera assistand Ron Vargas racks focus. Camera position is behind the end zone on the field. 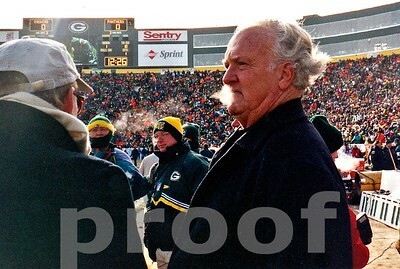 Packers Hall of Fame great PAUL HORNUNG lets out some cold air on the Frozen Tundra before the 1996 NFC CHAMPIONSHIP GAME which was played in -23 degrees below zero weather. 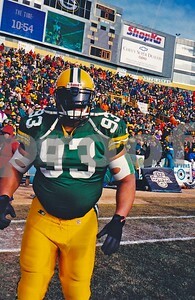 Green Bay Packers Hall of Fame DE Reggie White pumps up the Lambeau crowd before the 1996 NFC CHAMPIONSHIP GAME, won by Packers over Panthers. 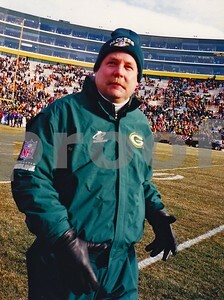 MIke Holmgren, Packers head coach walks onto Lambeau Field before the 1996 NFC CHAMPIONSHIP GAME won by the Packers over the Panthers. 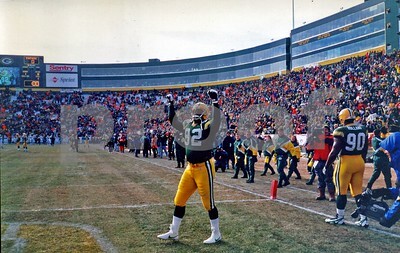 This was the first Championship playoff game in Lambeau since the Ice Bowl of 1967. 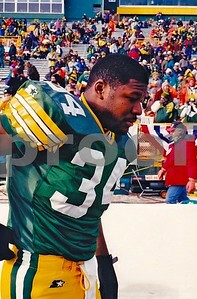 Packers RB Edgar Bennett in thought before the 1996 NFC CHAMPIONSHIP GAME. Edgar is now the Packers WR coach. 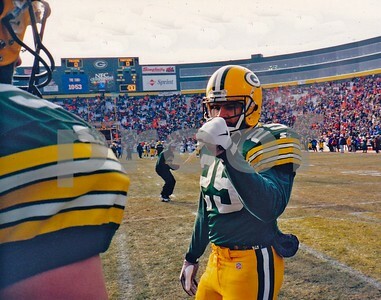 Packers RB Dorsey Levens, who would be named the MVP of this 1996 NFC CHAMPIONSHIP GAME about to give a "fist five" to a teammate before the game. 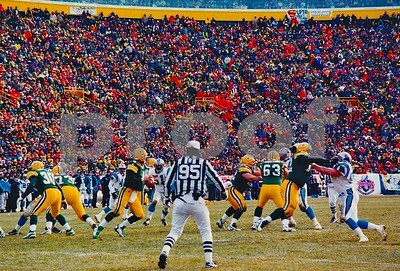 Green Bay Packers Defensive Linemen "warm up" on the Very Frozen Tundra of Lambeau Field before the 1996 NFC CHAMPIONSHIP GAME. 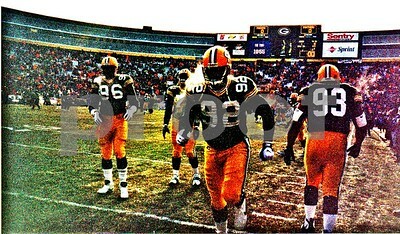 #92 is Reggie White, #96 is Sean Jones, #93 is Gilbert Brown. 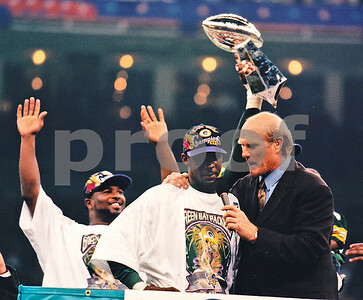 These men also won Super Bowl XXXI vs Pats in New Orleans. 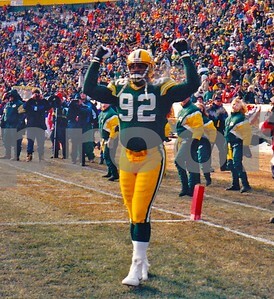 Green Bay Packers DE Reggie White gets Packer faithful cheering in pre-game of 1996 NFC CHAMPIONSHIP GAME on the FROZEN TUNDRA OF LAMBEAU FIELD. -23 below zero temperature at game time. 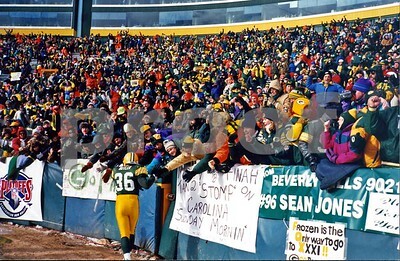 Green Bay Packer safety LeRoy Butler is cheered on by Packer fans during pre-game of 1996 NFC Championship Game in Lambeau Field. 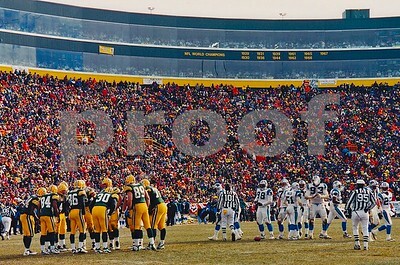 Brett Favre huddles up the Packers during the 1996 NFC Championship Game won by the Packers over the Carolina Panthers in -23 degree bitter cold on the frozen tundra of Lambeau Field. If you look closely you will see a Panthers lineman's face obstructed by his breadth. 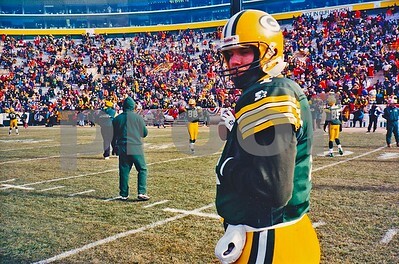 Green Bay QB Brett Favre in "The Pocket" about to complete a pass to WR Don Beebe. 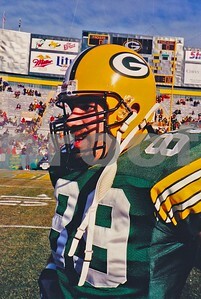 The Panther being blocked on right side of frame is current Packers line backers coach Kevin Greene. 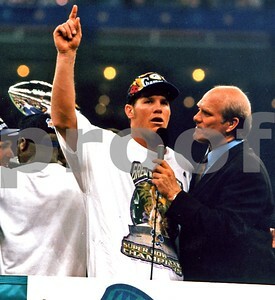 1996 NFC CHAMPIONS! 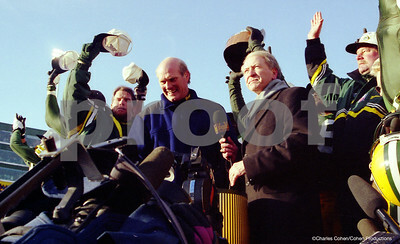 Brett Favre, Terry Bradshaw, Bob Harlan, Mike Holmgren, as the Packers receive the NFC Championship Trophy on a podium on Lambeau Field's Frozen Tundra. 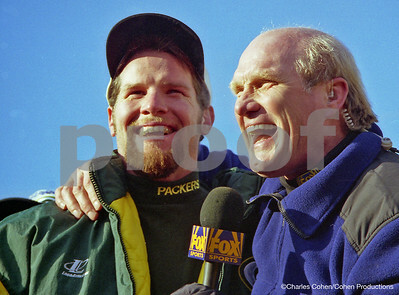 MVP Brett Favre and Terry Bradshaw share a laugh during the post game ceremony in Lambeau Field after the Packers beat the Panthers for the 1996 NFC Championship Title and a trip to the Super Bowl in New Orleans. 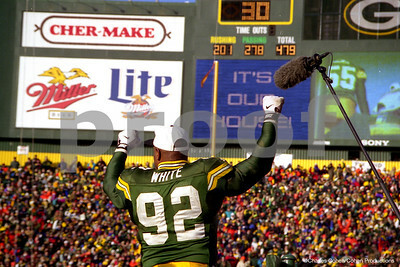 Reggie White reacts to the cheers from the Packers faithful after the Packers beat the Panthers to win the 1996 NFC Championship in Lambeau Field, Green Bay. The team's first such championship in 29 long years. 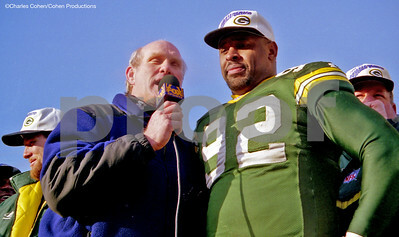 Terry Bradshaw interviews Reggie White after Packers win 1996 NFC Championship Game in Lambeau Field, Green Bay, -23 degrees below zero. 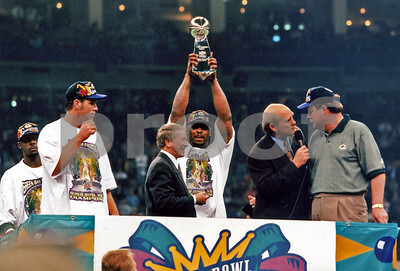 Packers Super Bowl XXXI post game celebration. 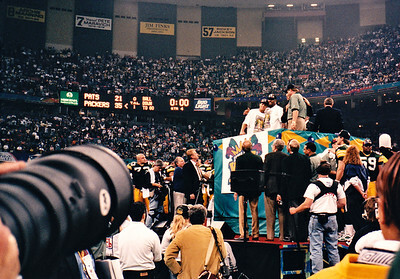 Reggie White and Brett Favre on victory podium with Mike Holmgren. 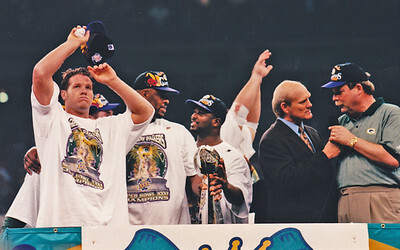 A relieved Brett Favre shares podium moment at Super Bowl XXXI with Reggie White talking to LeRoy Butler while both hold the Lombardi Trophy, and Terry Bradshaw interviews head coach Mike Holmgren. 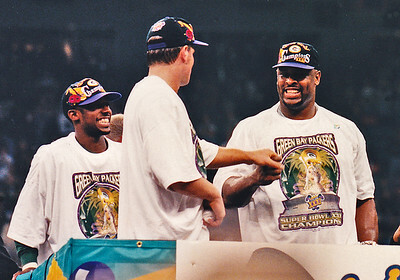 Three great and happy Packers celebrate Super Bowl XXXI Victory: Game MVP Desmond Howard, Brett Favre and Reggie White. 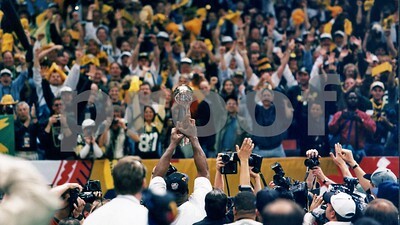 Reggie White hoists the Lombardi Trophy after the Green Bay Packers beat the NE Patriots in the 1996 Super Bowl. 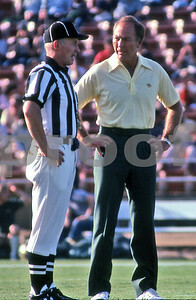 (L to R) MVP Desmond Howard, Brett Favre, Packers President Bob Harlan, and Terry Bradshaw interviewing head coach Mike Holmgren. 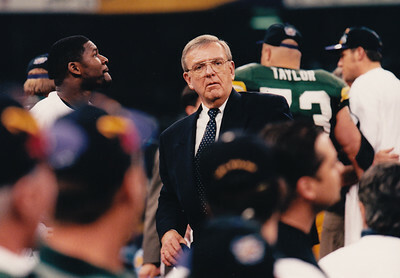 The Architect of the resurgence of the Green Bay Packers, GM Ron Wolf, post Super Bowl XXXI on field standing next to Packers RB Edgar Bennett. 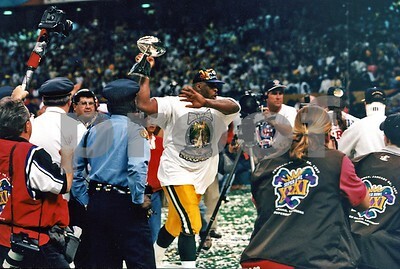 Green Bay Packers Great Reggie White runs around New Orleans Superdome stadium with the Lombardi Trophy after Packers beat the NE Pats for their 12th NFL Championship and 3rd Super Bowl Victory.